African Mango is a colorful fruit that contains Leptin, a protein hormone that influences metabolism and weight loss. High levels of Leptin send signals to the brain of fullness, so you are less prone to giving in to cravings and overeating. Raspberry Ketone is the primary aroma compound of red raspberries. This compound regulates Adiponectin, a protein used by the body to control metabolism. Raspberry ketones cause the fat within the cells to break up more effectively, help your body burn fat faster. Reduces Appetite ♦ Inhibits Fat Production & Increases Fat Burning ♦ Increases Levels of Serotonin which decreases emotional eating. Garcinia, derived from a pumpkin-like fruit, reduces appetite and interferes with fat formation by impeding the process whereby carbohydrates are turned into fat. Green Coffee Beans, in the unroasted form, contain chlorogenic acids, which reduce fat development in two ways: by inhibiting fat absorption within the gastrointestinal tract and by activating fat metabolism in the liver. Researchers have found that people who took green coffee bean extract lost significant amounts of weight and body fat even without a change in diet. WEIGHToff contains two breakthrough proprietary complexes: SLIMFORCE which helps force your body into a fat-burning state and LIPO-GLOW which is a clinically proven release and burn technology. Cellfood Natural Weight Loss Formula - This new proprietary formula combines Cellfood with fat burners L-Carnitine and Garcinia Cambogia Plant Extract to promote healthful weight loss even while you sleep! 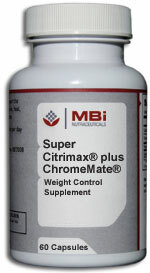 MBi Super Citrimax - Super Citrimax plus Chromemate works naturally for weight control without stimulating the central nervous system. 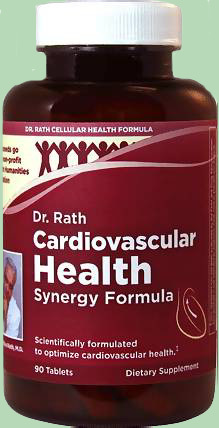 Non-habit forming and will not cause sleeplessness, nervousness, or rapid heart rate associated with diet stimulants such as Ma-Huang (ephedra) or caffeine. 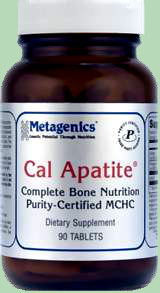 Metagenics Multigenics Intensive Care - Features a comprehensive Multi-Vitamin designed for enhanced absorption and bioavailability. A new study in the "International Journal of Obesity" shows that taking a daily multi-vitamin and mineral formula during a weight loss program is beneficial. 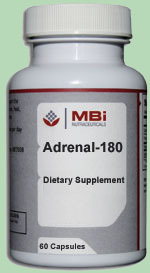 Those in the study taking a multi-vitamin lost an average of about 8 pounds compared to those who did not. The latest nutritional research has provided us with a few tips to help us meet our weight goals. Experts recommend you lose about one pound per week. That may not seem like much, but remember that would amount to 52 pounds per year. They also recommend that you eat to the point of satisfaction rather than fullness. As soon as you feel satisfied, push the plate away. 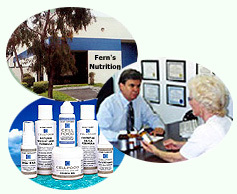 The food formula for weight loss is generally 3 parts carbohydrates, 2 parts protein, and 1 part fat. That means your food intake should be approximately in thus 3-2-1 ratio. Complex carbohydrates include vegetables, fruits, whole grains, and beans. They are the body's primary raw material for energy, and carbohydrates provide bulk that makes you feel satisfied. So when you go shopping a the market load up on fruits, vegetables, whole grains, and stay away form the processed foods that are high in fat. Another important point to remember is that you want to avoid metabolic slowdown. Provide yourself with the proper protein and nutrient intake to prevent you body form metabolic slowdown. When this occurs losing weight becomes extremely difficult and the body tries to preserve its stores of protein, nutrients and even fats. Reduce caloric intake but never go on a starvation diet. It just doesn't work. Reducing your caloric intake from about 2000 calories per day to 1500 calories, just a 500 calorie decrease will result in about a pound loss each week. If you are trying to slim down and lose a few pounds, there are nutritional products that can help you achieve your goals. They are not a substitute for good dietary habits or exercise, but they can be very effective in helping you achieve your desired weight.